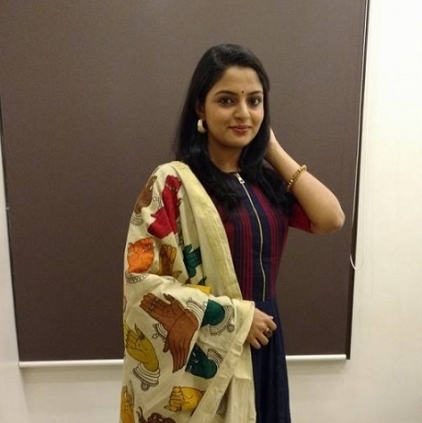 Nikhila Vimal of Vetrivel fame was seen in the latest release Kidaari where she was paired with Sasikumar. The film had people talking about her cute performance and we talk to Nikhila to find out about working in the film and the response for the same. “I am very happy to hear positive words. This is the second film that I am doing with the team. But my character in both the films is different. People were able to perceive the transformation from Vetrivel to Kidari. While working in the film, Sasikumar sir felt that my role would be talked about. A lot of my real life expressions have been used in the film. There were many interesting incidents while shooting for Kidari. I did not know to drive a two wheeler and had learnt only during the shooting. I was the first person to come to the sets and practice driving and was the last person to leave. I was trained by everyone in the sets to drive. Even when shooting was not there, I used to drive in the village ground and the villagers had also helped me learn driving. You can say everyone in the team coached me to drive a two wheeler. When I had to focus on my driving and also expressions, it was difficult. The most difficult one was my first shot in the film when I had to take the moped and give a ride to chittappa character. It was a single shot. I was so tensed. That vehicle was such an old one to match with the setting. If I want to stop it at a point, I need to apply the brakes well ahead so that it would stop at the required spot. I also warned them saying I will try but can’t assure if I can ride properly. I had driven well in the first take but the shot had to be taken again for some correction. Again, I got scared. I was also tensed for chittappa because he is an old man. He had to give a shocked expression and for this, the unit taught him ‘Nikila does not know to drive moped but you need to pillion ride with her’. They did not tell him the actual reason. He was really scared, shocked and gave the expression for this only. Somehow I managed and by second schedule, I improved my driving”. That was very interesting Nikhila! People looking for online information on Kidaari, Nikhila Vimal, Sasikumar will find this news story useful.